One can't help but describe Rhythms from a Cosmic Sky without adjectives of lofty and extraterrestrial magnitude. The good news is that the music is worthy of such celestial praise. Let's get grounded with the fundamental, plain-spoken truth. Earthless is a San Diego-based trio whose members have served in Rocket from the Crypt, Hot Snakes, Nebula, Electric Nazarene, and Black Heart Procession. Rhythms from a Cosmic Sky is their second release, following 2005's two-song Sonic Prayer. Now, shall we take to the air and head for the cosmos? One can't help but describe Rhythms from a Cosmic Sky without adjectives of lofty and extraterrestrial magnitude. The good news is that the music is worthy of such celestial praise. e) Cascade, the final two minutes, in which the tempo slows as if a behemoth is landing and the guitar is enveloped within a spiral of its own feedback. And that's just the first track. Outlasting its predecessor by 17 seconds, the second track, "Sonic Prayer", begins with a meditative opening. Not surprisingly, the sitar-sounding effect is quickly subsumed by sheer sound. Here Mike Eginton's bass plays a more prominent role than in the first track and the rhythm section creates a trance-like foundation upon which guitarist Isaiah Mitchell can invoke his best cosmic frenzy. There's a major transition at roughly the mid-way point, as if the worlds of pscyh rock and free jazz have been thrown into a molten pot where points and counterpoints melt. Mario Rubalacaba's drums move into a tribal realm and build suspense and drama, pushing to a culmination that carries through the last five minutes of the song. The wall of sound created during these closing minutes has, on the surface, a surprisingly tranquil feel. By the song's finale, in the 21st minute, the listener has been drug through several disparate worlds and is left in a trancelike stupor. "Sonic Prayer" is an apt title. These first two tracks aren't for tuning out; they demand your attention and invite you into their own stratosphere. Shortening the length substantially, Earthless wraps up the album with a cover of The Groundhogs' "Cherry Red". 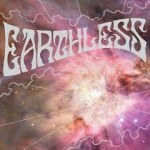 The song adds a falsetto to the elements found in the earlier suites, and, over four-and-half minutes, shows that Earthless can also succeed using brevity. Still, the band's strengths lay in instrumental, improvisatory explorations. With the release of Rhythms from a Cosmic Sky, Earthless has now, over two albums, put four thematically-similar 20-minute jams to tape. It will be interesting to see how they keep this format durable and engaging. Earthless' live performances apparently consist of "just one long song" that can last up to an hour; perhaps album number three could be a compilation, "double live", capturing the band's spontaneity. The audience might start off in a beery rock club, but, through some crafty sonic propulsion, end up cosmos-bound.